Here is only a small portion of what premium members receive on a nightly basis. MARKET RECAP- Some more red numbers for the indices today. 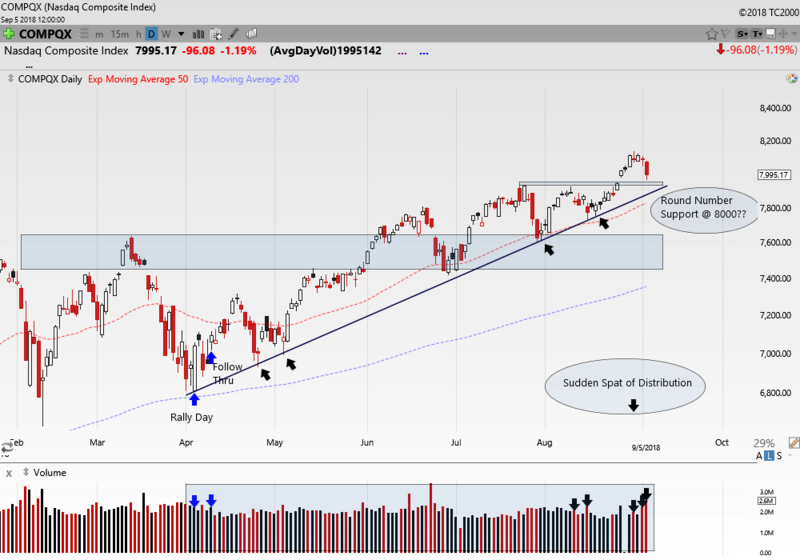 Tech stocks and recent momentum plays endured the brunt of the selling with the Nasdaq and Nasdaq 100 losing over 1% each registering back to back distribution days in the process. Traders seemed to hide in the industrials as the Dow was the only index to finish in the green, although barely. Each of the indices we track posted interesting days in their own respect so let’s get right to it tonight and take a look. 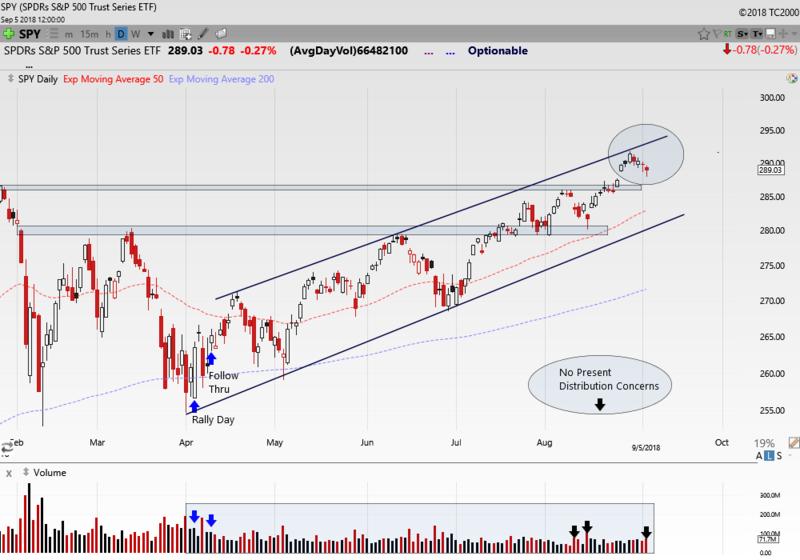 SPY- The S&P 500 ETF posted a distribution day of its own, but it was not as ominous as the Nasdaq’s. The percentage loss of 0.27% was not far above the 0.20% level need to technically qualify and the index did finish in the top third of its range for the second straight session showing some resilience from the bulls. We are still in a comfortable zone in regards to distribution days with only three on the books, but it may be a good time to remind you that a sharp decline in the indices doesn’t necessarily have to announce itself with six or seven previous distribution days. NASDAQ- The Composite printed a more ominous looking day losing nearly 1.2% on a big increase in trade. 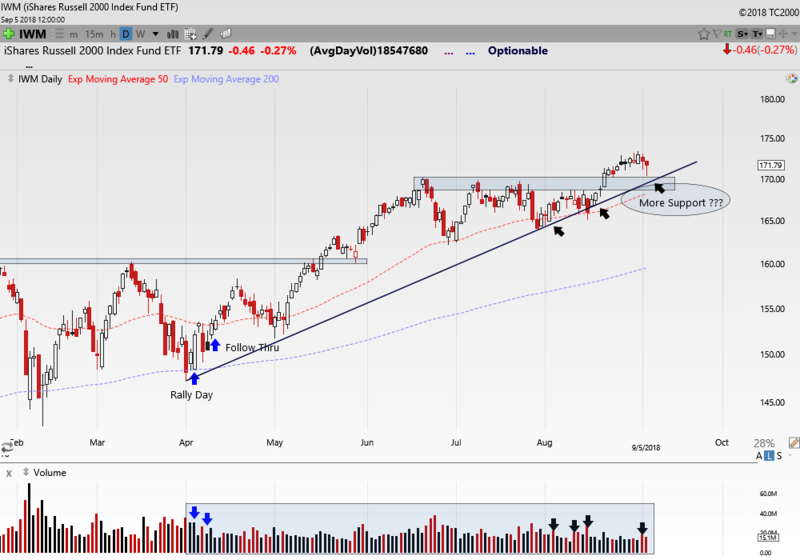 This is the third distribution day in the last four sessions, which is not a good look however, before we jump to any conclusions we must consider whether todays big volume was a sign of round support near the previous breakout area in late August rather than traders abandoning ship. The next couple days may tell us a lot in this regard. 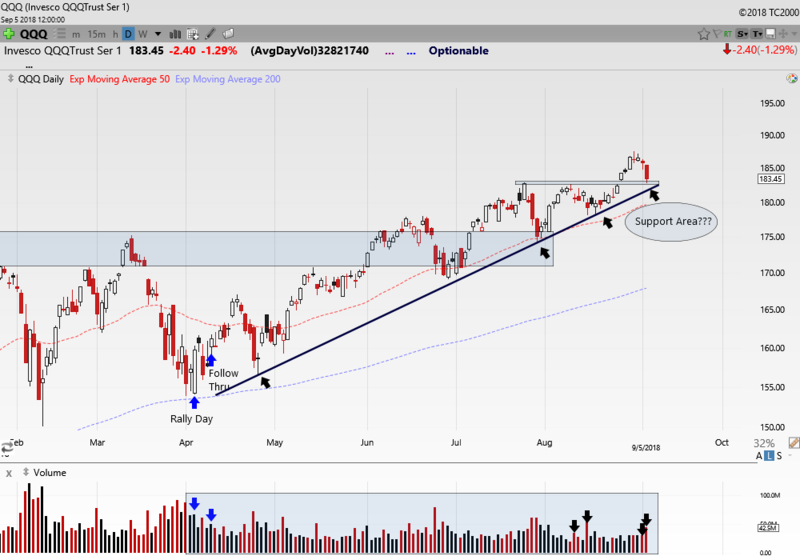 QQQ- The Nasdaq 100 printed an equally dreary day as volume swelled over Tuesdays session marking a second consecutive distribution day. 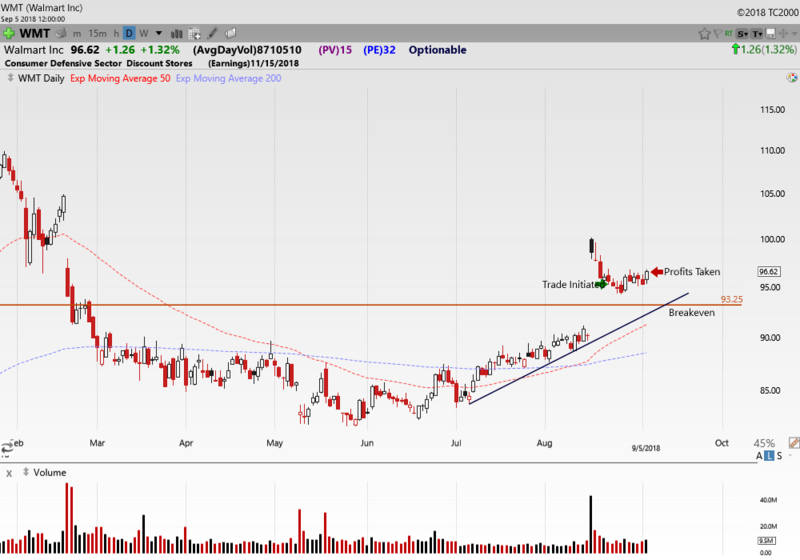 The loss did stop however at the previous breakout area near $183.00. We now have four distribution days for this index over the last 25 sessions. IWM- The Russell 2000 was much better behaved today as its modest 0.27% decline was met with a noticeable decrease in volume over yesterdays distribution session. In similar fashion to the other indices, the index also bounced at previous breakout support just above $170. TRADING RECAP- We sat on our hands again today, and honestly as much as I like, want and need to trade, I don’t have an issue with this. As important as it is to learn how and when to trade, it is equally important to be willing not to trade when things are not matching up with your method and not offering what you feel are good risk/reward metrics. This game is hard enough when things line up just right for your trades, let alone taking stabs at mediocre set ups. No, we are not perfect and have, and will in the future, put on trades that we look at despairingly in hindsight, but that is just being human. Our goal is to eliminate as many of those trade situations as possible. There will be more trades and likely they will come in a wave as is often the case, until then we continue to stalk good set ups. As far as todays trading is concerned, we were able to fight off some of the selling in the general markets closing out WMT for gains and our AGN spread trade went in our favor as well. PENN was the only downer suffering another red day. Let’s take a detailed look starting with the profitable closing of our WMT credit spread trade. WMT- We decide to close out our September 94/90 credit put spread into strength today as the stock drastically outperformed the market gaining 1.32%. We were tempted to hold on a bit longer to squeeze a bit more out of the spread, but once option prices fall to near $0.25 it takes a lot push them down much further without going right up into expiration with the trade, unless the stock makes a substantial advance which is never a guarantee. In trying to get that last $0.20 or so out of the trade you start to incur much more risk compared to what you have to gain. We like to at least get back a minimum of 50% of the premium we sold, and in this case we were able to capture a touch over 60%. We closed out the trade for the portfolio by buying back the spread that we sold initially for $0.75 for $0.29. Many traders will try to pass this off as a 61% gain however, this is not accurate. As we discussed, you must figure your return on the margin risk, or the max loss you could have sustained which was $1300 in this case (the 4 point wide spread times the four contracts, less the initial premium received). So, we returned 14.15% on our risk in just nine trading days. Perhaps we take another stab at this stock, but for now we pocket our profits and move on. As I stated in the alert, I only closed out the short leg of the spread keeping the 90 strike long puts open. I bought the short 94 strike back for $0.36, sacrificing the 7 cents currently left on the long puts. This is something you can occasionally do when the buy leg of your option gets down to nickels. This leaves you with a lottery type play in case the stock, or the general market gets hit with large unexpected losses. I closed the entire spread trade for the portfolio for easy record keeping and tracking purposes a the then market price of $0.29. AGN- After taking a one day rest from its current advance, the stock rebounded today once again finding support at its two month trend line. The stock added $1.13 in todays session and our October 190/200 bull call spread that we paid $3.20 for climbed to $4.29 leaving us up 34% on the trade so far………To get full access to the premium site where you will receive real time stock and option trading alerts, weekend video watchlist, nightly and weekend updates of the indices, as well as open positions go to http://www.ttptrading.com See you there!